Mathew: Dude! You sank my battleship! Mathew: You sank my battleship! That's the line! Mathew: The line from the Hasbro, fast-paced strategy game for 2 players ages 8 and up that this movie is based on. Helm: Ah, that explains it. You dragged me to yet another movie based on a children's game. Mathew: And it was AWESOME, Helm! So much crap blew up in this movie, I thought my ears were going to bleed! I thought my seat was going to catch fire! Helm: And that is the best criteria for judging a movie? Mathew: Exactly! Well, for judging this kind of movie, anyway. Helm: I was not as impressed. Mathew: But... but... What about all that stuff that blew up?! And the awesome bits where the music was super cool and the aliens were beating down on the humans? Or where the music was super cool and the humans were beating down on the aliens? Or even those bits where the music was super cool and the humans were beating down on each other? What about all that?! Helm: Yes. That did happen. Many things exploded and there was a great deal of beating down. Helm: But what about the plot holes? What about the fact that the aliens behaved inexplicably whenever that was convenient for the writers? What about the inconsistent use of advanced alien technology? Mathew: All that stuff can be drown out if there are enough explosions! 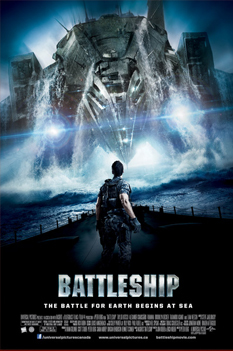 Battleship isn't really the kind of movie you go to if you're going to be all logical and pay attention to details. Save that crap for when you're watching Sherlock on PBS. This is the kind of movie for yelling, "HELL YEAH!" at the screen. Look, I don't want to hear any of this critical bull crap out of you when they finally make Barrel of Monkeys into a movie. Helm: I believe it may be time for us to review some books. Mathew: What?! They don't make games like Battleship into books, Helm! Helm: That is my point. Two and a Half Flaming Swords!! Four and a Half Flaming Swords!! Mathew: Really? Two and a half flamers? That's all? Did you not see all the crap that blew up in this movie? Helm: Two and a half is generous given how much crap I did see in this movie.